Toy Soldier Jumbo 46" Crane Redemption Machine as seen in amusement centers and arcades everywhere. Also great for birthday parties or play just for fun! This fun and exciting JUMBO crane is a prize redemption machine, through which players have to try and earn prizes by using the claw to grab the toys and drop them down the chute. Players simply sue the joystick to move the claw into the perfect position, then hit the button when they want to drop the claw and pick up their prize. After this the claw will automatically move back over the chute and drop the prize if it grabbed one. The Toy Soldier crane earns well in a wide variety of locations such as, street locations and Family Entertainment Centres. 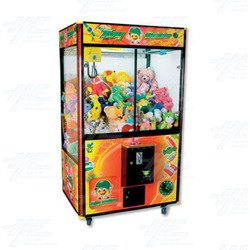 Toy Soldier Jumbo 46" Crane Redemption Machine as seen in amusement centers and arcades everywhere. Also great for birthday parties or play just for fun! This fun and exciting JUMBO crane is a prize redemption machine, through which players have to try and earn prizes by using the claw to grab the toys and drop them down the chute. Players simply sue the joystick to move the claw into the perfect position, then hit the button when they want to drop the claw and pick up their prize. After this the claw will automatically move back over the chute and drop the prize if it grabbed one. The Toy Soldier crane earns well in a wide variety of locations such as, street locations and Family Entertainment Centres.